Alfred John Tay was a float maker in Victoria Street Redditch when he invented a rather ingenious method that would enable the angler to change from one type of float to another quickly. 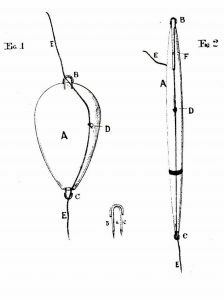 Hi invention, a double loop staple — a bit like a paper clip, also combined a pin to loop the line around so that the depth at which a float was fished could be easily changed. A Tay Float from the 1912 catalogue. Tay was the number one float maker in Redditch when in 1878 Samuel Allcock decided to enter the float making business. He persuaded Alfred Tay to joint him complete with all his employees and his American export business, an instant float making department. The Tay wires can be seen on many of the early Allcock floats along with the patent number 13116. The Allcock float model 3206 shown below has patent number 23775 on it. This is a little confusing as this is wrong. Could this have been a printing mistake? And what angler at the time was going to go to the Patent Office check it out and complain to Allcock’s? None I suspect! I have a few floats in my collection with the only word Patent on them (no number). These floats are not impossible to find but are scarce. This entry was posted in Antique Tackle Observer, Tay Fishing Floats. Bookmark the permalink. It’s great to see that your web-site is active again – thanks Stefan. I was a subscriber to the Antique Tackle Observer and still miss it for the high quality of its content. Dear Stefan, this is of interest to me as Alfred Tay was my great-grandfather. This is the story of how Samuel Allcock came to acquire the Tay business, as related to me by my mother: Alfred had a successful floatmaking business at 8 Victoria Street, employing three men and three women, which he and his older brother George had taken over when their father, William Tay, died in 1874. George Tay would travel over to America by sea at regular intervals, to do business with the American dealers and obtain payment for the goods supplied. However, one year he returned empty-handed. How he lost the money is a mystery; it was never talked about, but suffice it to say that George was regarded as the black sheep of the family for many years after! This loss represented a large part of a year’s turnover, a serious financial blow, and as a result of this, in 1878 they were forced to sell the business to Samuel Allcock, the largest fishing tackle manufacturer in the town, and all went to work for him. They set up a complete new float workshop at Allcock’s, with Alfred as foreman. His brother George, and cousin Luke Sealey, also went to Allcock’s with him, along with all the tools, effects and stock of the business. As far as I know, Alfred continued to work at Allcock’s up to his death in 1909. However, his contract with Allcock’s apparently did not preclude him from working on his own account and I believe he retained some tools and equipment in the workshop at the back of his house and indeed, the patents he took out in 1892 were in his own name and not that of Allcock’s. Alfred’s lathe, operated manually by a foot treadle, was still in the family until quite recently. Sadly I believe it went in a skip when my uncle, Chas William John Tay, died about seven years ago. Regarding the patent numbers, Alfred took out two patents, both in 1892: patent numbers 13116, and 23775. You probably have copies of the patent documents but if not, please contact me and I can send you them. There are quite a few of these floats still around, but I have been told that any that do not bear the actual patent number are quite likely to be fakes! Finally, I am always interested in any new information about Alfred, and would particularly like to know more about his American trade, so if you can help me with this then please get in touch. – Many thanks. PS I have photographs of Alfred Tay and his family – let me know if you are interested.